Harsh and I were eagerly awaiting the day when our Mom and Dad would have their first flying experience. Fortunately, this trip unwrapped first of their many experiences be it their first flight, first time to a beach, first ferry ride, first jungle safari and last but not the least first time such a long family trip. 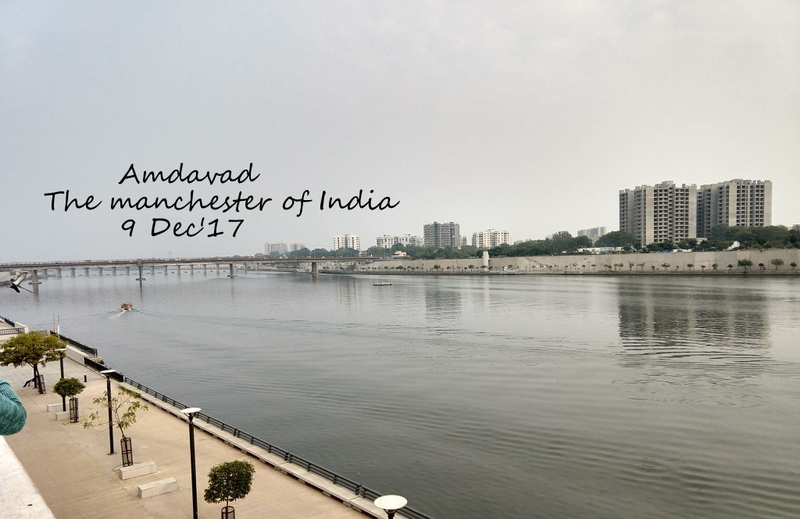 We boarded our flight from Delhi airport and landed in Ahmedabad aka Manchester of India, in around 2 hours. 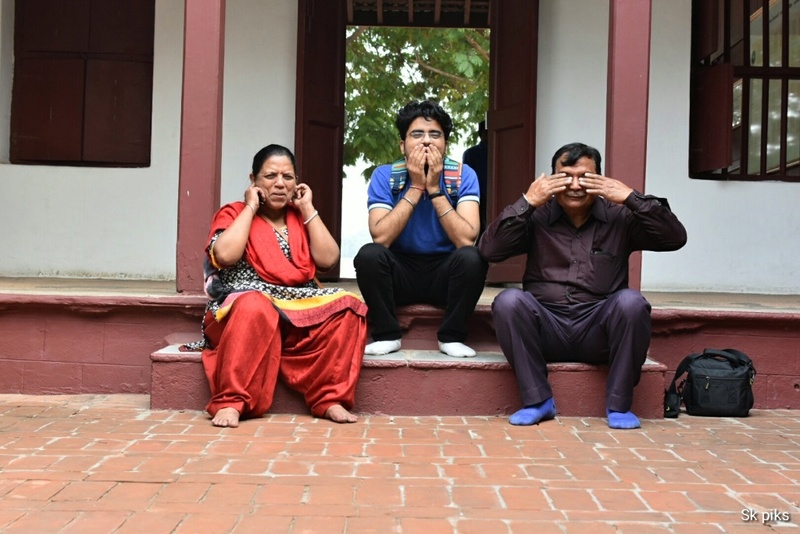 Since the time we landed there in the city, mother of the house wanted to see the Sabarmati Ashram. And it was the first to-do in the itinerary too. So, we booked Uber(a cab service) from our hotel and as I entered this place stretched over Sabarmati river, a sense of tranquility engulfed me from all around. It felt like stillness and purity were mixed at the same time and in equal measures. I was amazed at how can a place so quiet, so secluded be the center point of such a significant moment of India’s independence. Well, I guess it all had to do with the man called “Father of the nation”. Well, I will try not to write here about Mahatma Gandhi as his virtues and greatness are already known worldwide. The Ashram was spread across with small hut-like structures throughout the open area. and the Sabarmati river flowing gently beside the ashram added to the beauty. 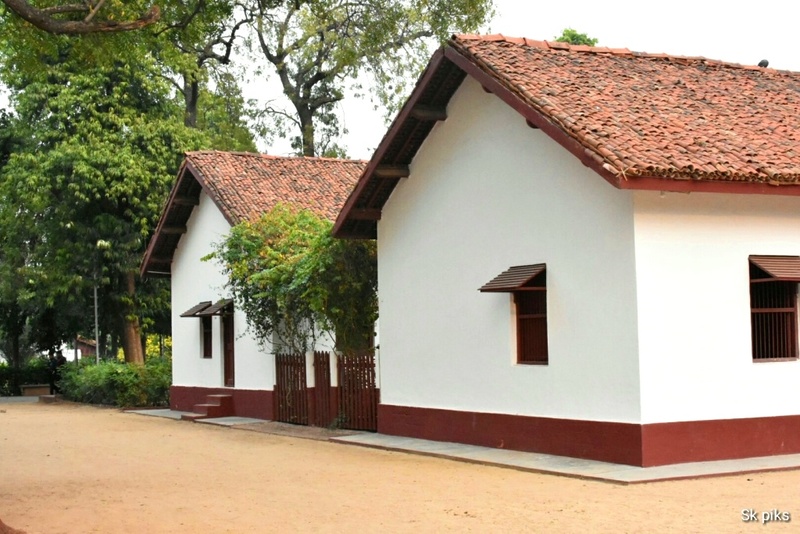 The most sought-after sight at the ashram was Hriday Kunj which was Gandhiji’s residence for 12 years. We walked barefoot inside this small cottage and found a lot of things which he used; a writing desk, a yarn spun by him, personal letters, wooden slippers, round glass spectacles, and utensils used by him. This room surely gave us the sneak peek into the life of MK Gandhi. 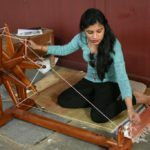 I got really fascinated to see the original Charkha for the first time and couldn’t able to stop myself from trying my hand at it. 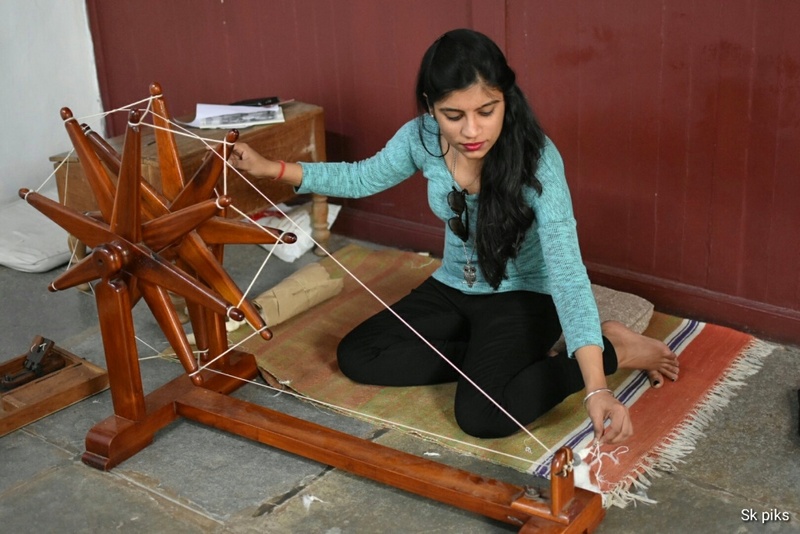 It was really fun to see how a cotton gets converted to a thread. Magic, I must say! 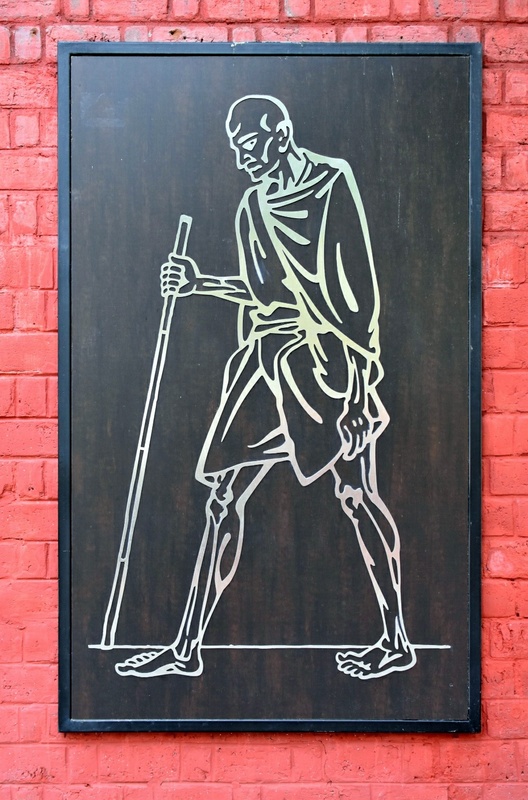 Then, I saw this picture hanging on the wall which symbolized the principle of Gandhi’s Satyagraha. While wandering the ashram premises, we saw Gandhi Smarak Sangrahalay(museum) designed by Charles Correa. 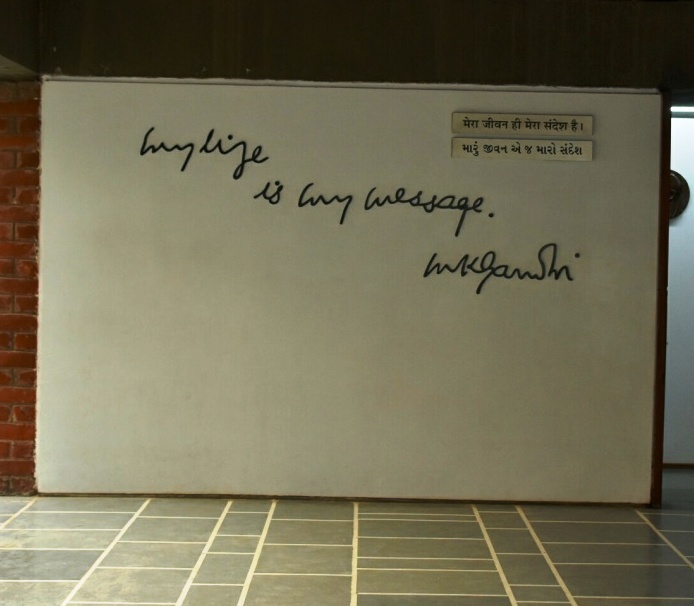 The museum had three spacious galleries – Gandhi in Ahmedabad, My Life Is My Message and Painting Gallery. For me, the main highlight was the 8 life-size oil paintings. 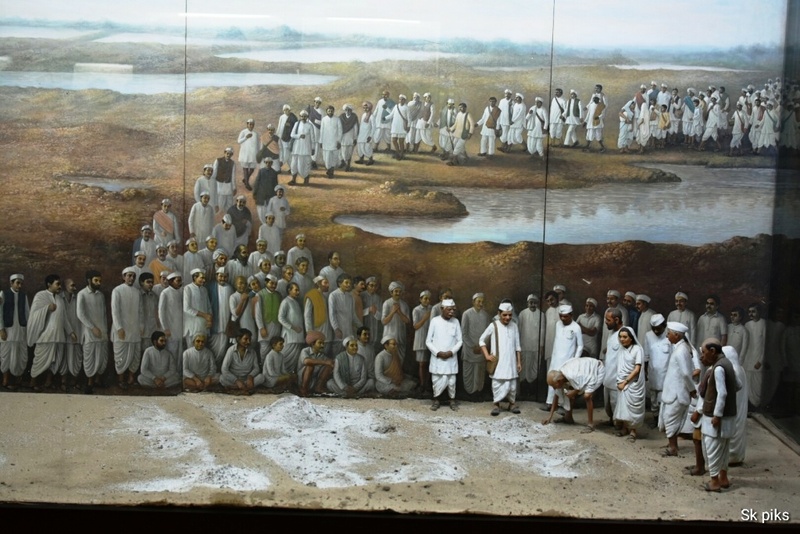 The sight was really a testimony to so many important historical events of the Indian freedom struggle. 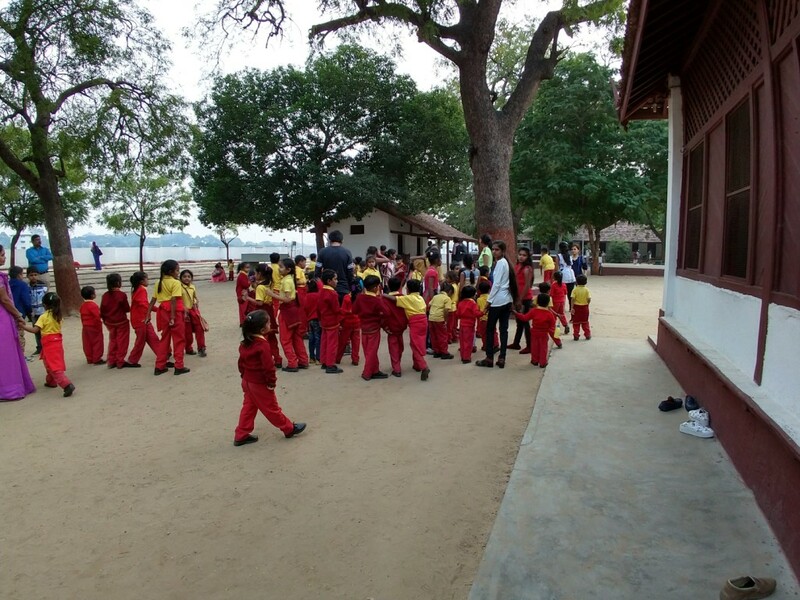 Along with the museum, this ashram also houses a library and an auditorium. Iconic quote by MK Gandhi ! After strolling here and there, I was feeling little hungry and then out of nowhere, this man appeared along with the basket of ‘Chana jor garam’. This snack made out of black gram is not so common in Delhi. While savoring this yummy snack, we bid adieu to the stillness in the air. 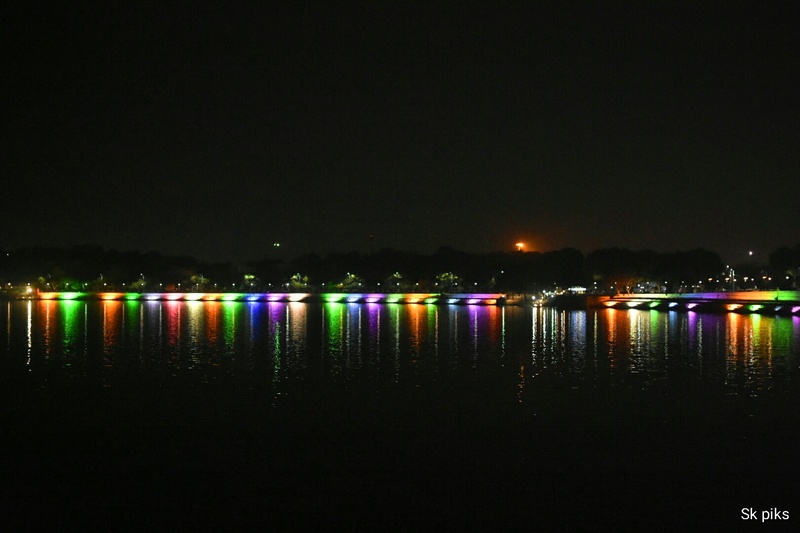 The Kankaria Lake is a 34 sided polygonal lake which is also known as Qutb Hauz, built by Sultan Qutbuddin in the 15th century. 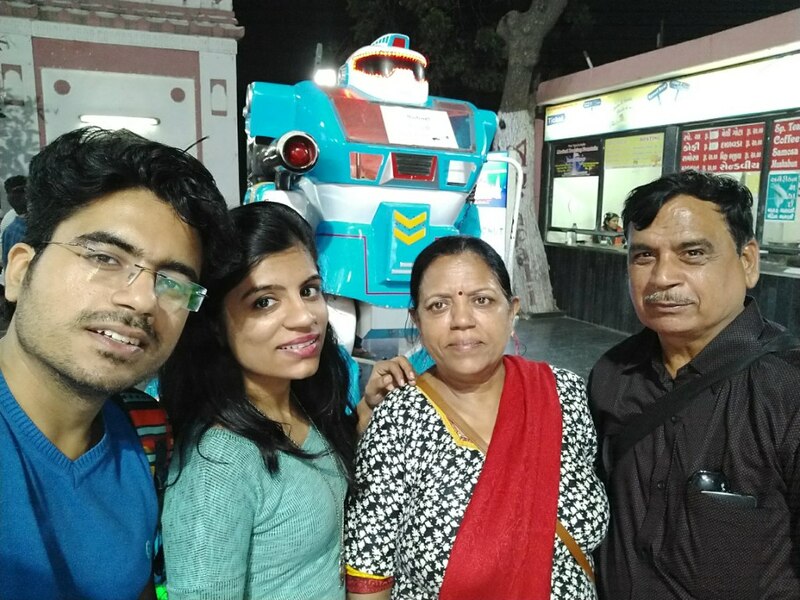 Whatever the tourists can seek for, they will find it here like Mini toy train ride, zoo, a fun city for kids, fish aquarium, butterfly park, food court, ball Vatika, joy rides, Naginawadi, and sports activities: paragliding, balloon safari, and the boat ride. 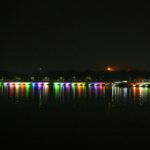 As we entered the place, I saw the lake lit up with colorful lights all around its periphery like a queen necklace. It was an amazing sight to behold. 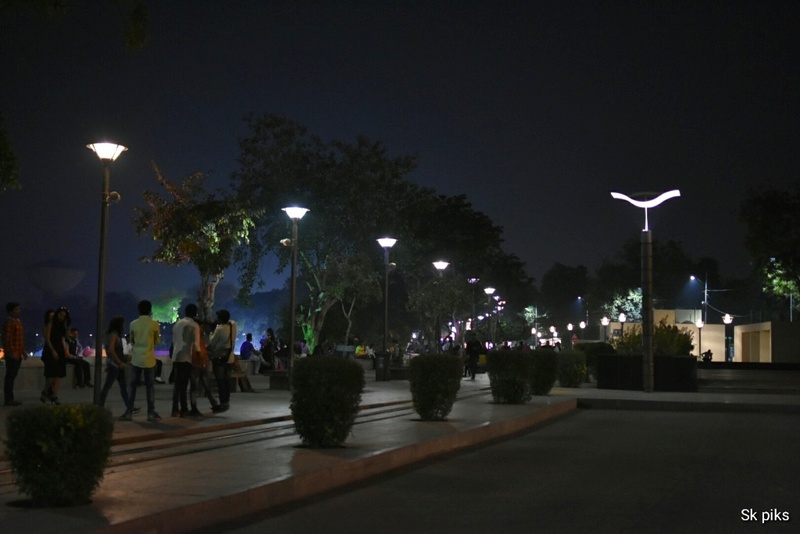 I found the promenade around the Kankaria lake as one the few places where one can walk without the hear of being hit by a vehicle. 😉 Have I spoken too early? Then, I saw a toy train coming towards me out of nowhere. This is how I came to know about the toy train ride which runs on a 2.3 km track circling the lake. Naginawadi, an enchanting island in the center of the lake was no less than a pleasure pavilion. 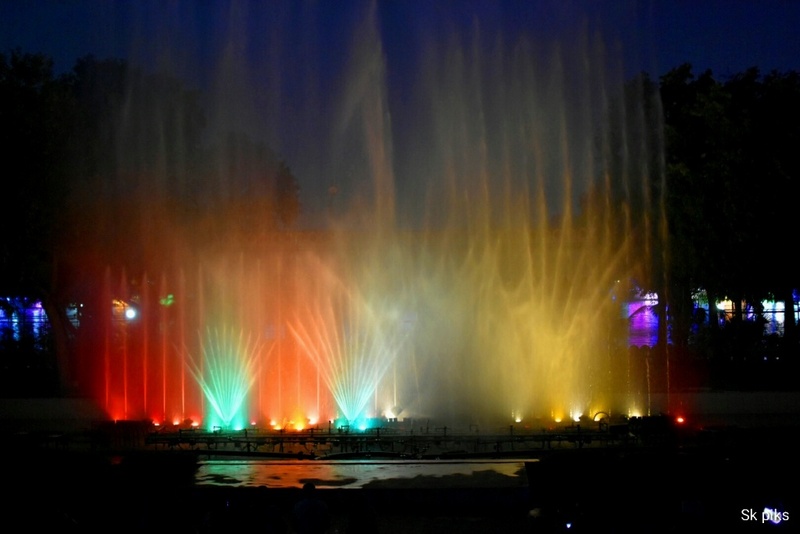 One can buy tickets for laser show which offers a beautiful symphony of water, light, and sound. Law garden night market, bustling with shopkeepers and vendors, was no less than a paradise for the shopaholics like me ;). 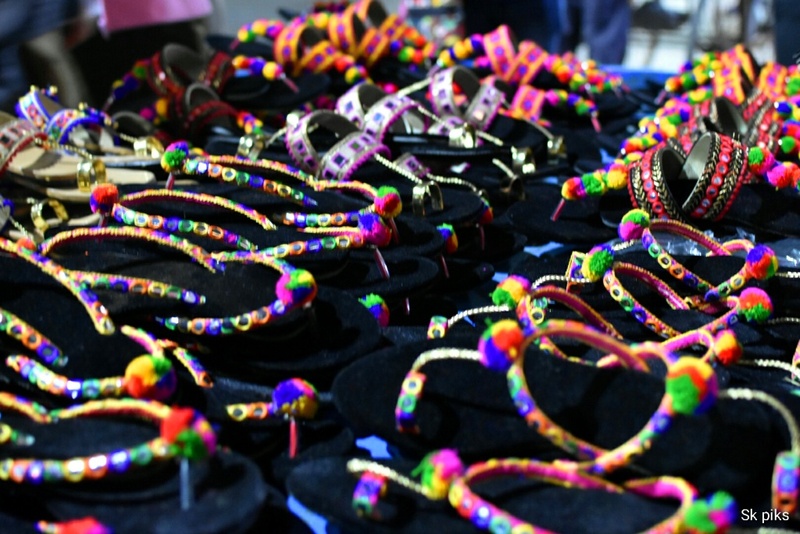 There were wayside shops selling handicraft items, Gujrati chaniya-choli(worn during Garba dance in Navaratri festival), handbags, sarees, wall hangings, antique jewelry and much more. Furthermore, the prices were quite reasonable, and with a skill of bargaining, one can definitely grab an item at the cheapest price. The exclusive bandhani sarees embellished in golden silk threads and zari works was something one cannot avoid to buy. 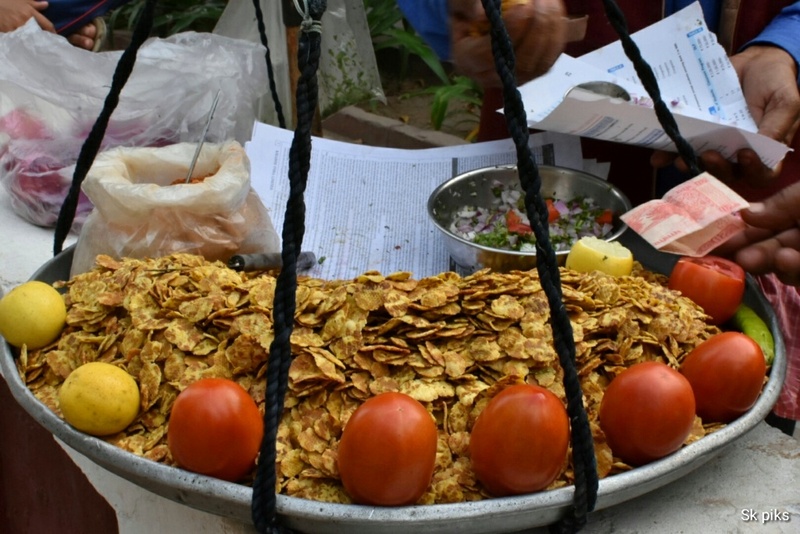 Besides, the street hawkers selling various kinds of mouth-watering Indian delicacies: kairi(raw mango), imli(tamarind), salted peanuts and sev chaat are worth to give a try. We left the place with overflowing items stuffed in our shopping bag. 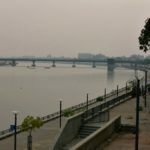 Best time– The best time to visit Ahmedabad is during the winter season i.e from October to March as the weather is just apt for enjoying the beauty of nature. Pols- Each Pol is socially and architecturally homogeneous and provides a territory for the interaction, cooperation, and interdependence. 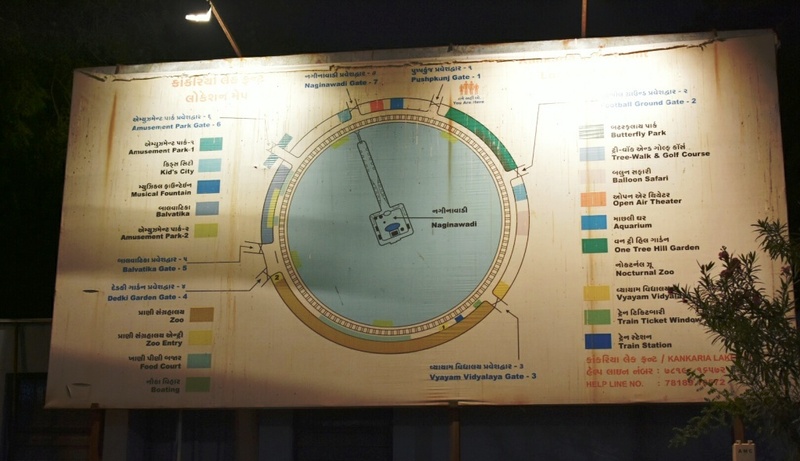 Heritage of these Pols has helped Ahmedabad gain a place in UNESCO’s Tentative Lists. Situated on the banks of the river Sabarmati, the walled city of Ahmedabad or Amdavad is a perfect blend of ancient heritage and a vibrant modern life. 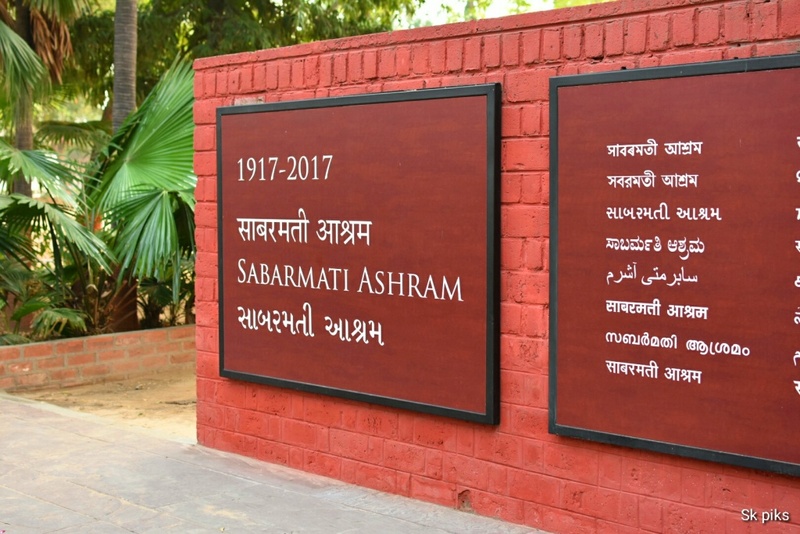 From Sabarmati Ashram to the Sidi Saiyyed mosque, every nook and corner of the city holds a story to share and imparts a scent of the bygone era. So, what are you waiting for? 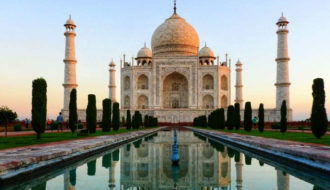 Pack your bag to spend few days in Gujarat, the westernmost state of India. 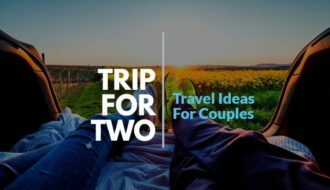 Let us know how do you like the post by leaving a comment below and stay tuned for travel posts on Bhuj, Runn of Kutch, Dwarka, Somnath, Gir, and Diu!! I also want to visit this place now !! Really amazing it is, Incredible!!!! 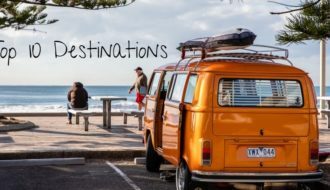 Your blog is as great as u…. Thanks, Vikas:) I am happy that you liked the content and the place of course. Stay tuned for the upcoming posts on Bhuj, Rann of Kutch, Dwarka, Somnath and Diu!! 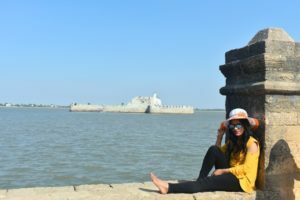 Stay tuned for upcoming posts on Bhuj, Rann of Kutch, Dwarka, Somnath, and Diu! !